The Rockport Film Review: Zack Snyder's "Dawn of the Dead" Remake, Better than Original? Zack Snyder's "Dawn of the Dead" Remake, Better than Original? 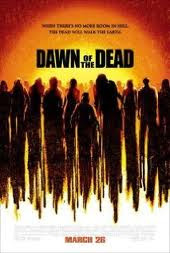 Zack Snyder’s 2004 remake of the classic George A. Romero zombie movie “Dawn of the Dead” was a milestone in many ways. It helped launch Snyder’s career and has since directed “300” and “Watchmen”. “Dawn” is a spectacular remake, some say better than the original. It introduced us to the fast, sprinting zombies. It did however also help set in motion the trend of remaking every old horror they could dig up no matter how bad it is. “Dawn” follows in the original's footsteps, but it also blazes its own trails too. When the zombie apocalypse is upon us, a group of survivors led by a nurse (Sarah Polley) and a cop (Ving Rhames) they find solace in The Crossroads Mall. This was a big statement in the original film, about the countries growing consumerism. Barricaded in the mall and surrounded by hordes of the undead, they must figure out a way to survive and come to terms with the fact that everybody they know and love is gone. “When there is no more room left in hell, the dead will walk the earth” This is a great line spoken by a preacher, just before the station goes off the air. As with most survival horror films, this group of diverse people must learn to work together if they want to survive. The acting and character development is quite good for a horror movie. You know these people and want them to survive. 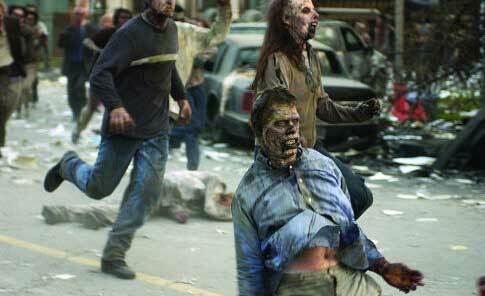 As I mentioned earlier, the classic images of slow moving zombies have been given a serious makeover. These flesh-eating freaks are like Olympic sprinters, making them a frightening real threat. The makeup effects and CG and very well done for the most part, and the gore makes it well worth the price of the unrated DVD. This movie is literally unstoppable as it continues in snippets right through the end credits. Zack Snyder’s vision and filmmaking sense is just what this generation needs. With “300” being another monumental hit, he seems to have a bright, limitless career. Please, please don’t be another M. Night Shyamalan.